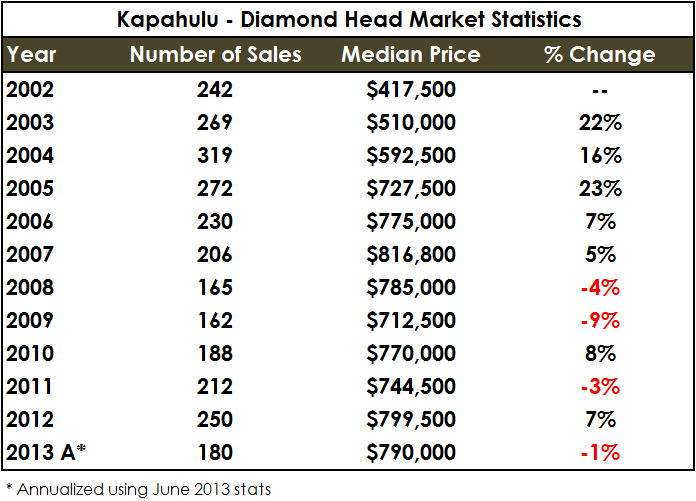 Kapahulu – Diamond Head: Unscathed by the Great Recession? I was at lunch with a friend this week, and he suggested the idea that home prices in his neighborhood (near Diamond Head) may have escaped the Great Recession altogether and, in fact, appreciated a bit along the way. 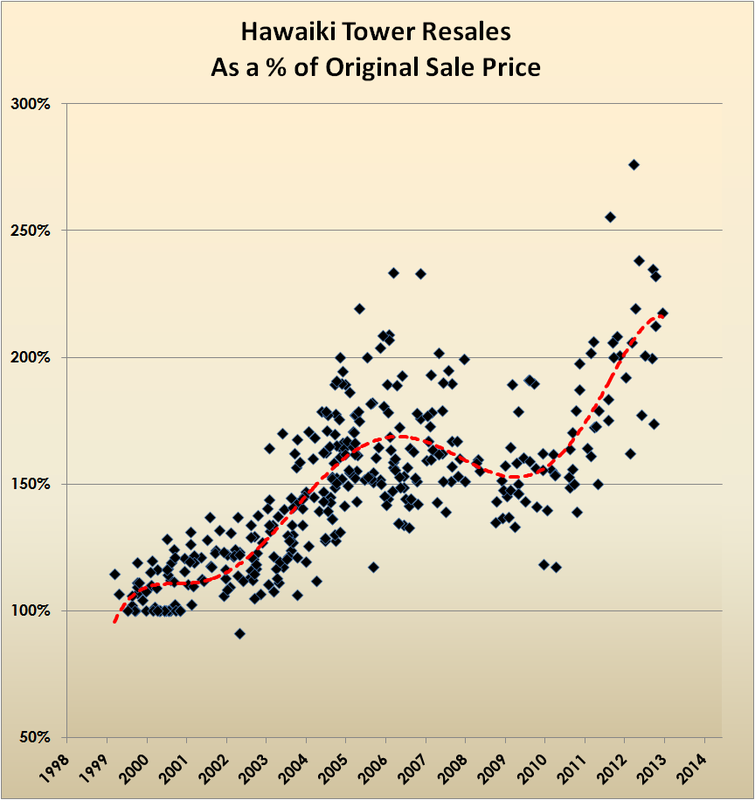 While it is common knowledge that the worldwide financial crisis did great damage to real estate prices in much of the United States, Hawaii was impacted less, and it is certainly possible that a desirable sub-market (like the Diamond Head area) could have emerged unscathed. The graph clearly shows the amazing run up in prices experienced in the subprime era (pre-2008), with median price peaking at over $800,000 in 2007 (number of sales topped out at 319 in 2004). A closer look reveals the supply/demand relationship: As the median price continued to climb after 2004, fewer and fewer buyers were pulling the trigger. Conversely, when median prices bottomed out in 2009, demand began to increase. 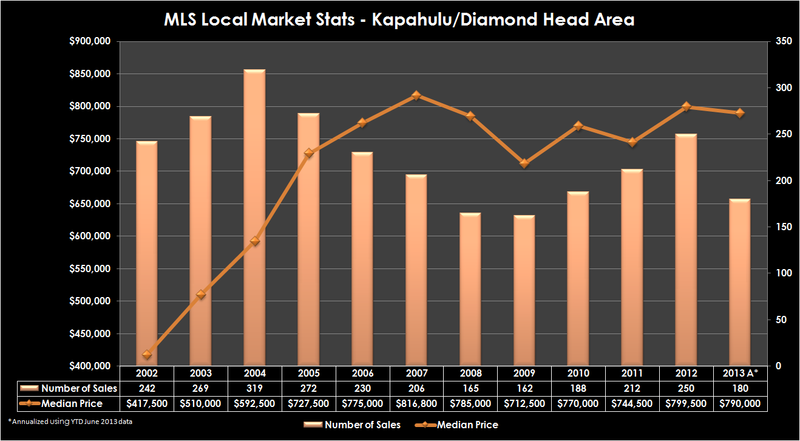 From the peak of the market in 2007, the Kapahulu – Diamond Head submarket declined four and nine percent in 2008 and 2009, respectively, and about 13 percent overall, before recovering a bit in 2010. Considering these figures, it looks like my friend’s neighborhood took a moderate price hit after the collapse of Lehman Brothers….but our work isn’t done. Wait a minute. 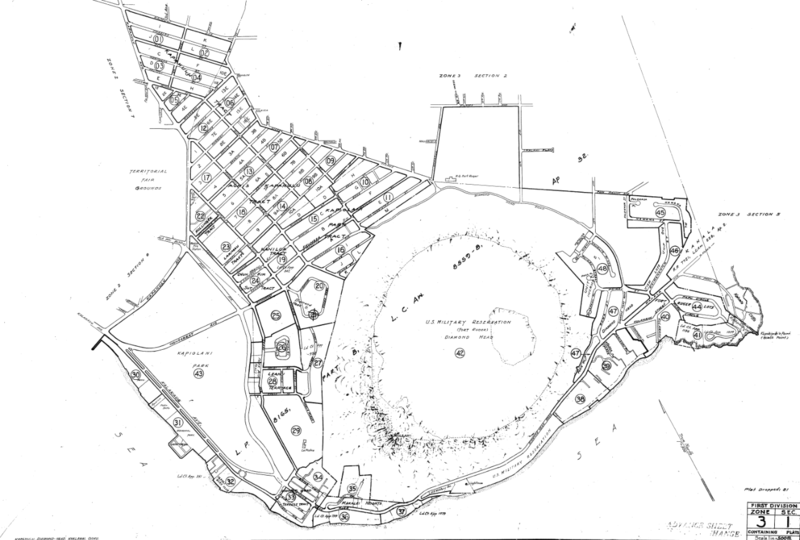 Kapahulu – Diamond Head, that’s kind of a mixed bag, isn’t it? It is. And as it turns out, much more mixed than I originally thought. 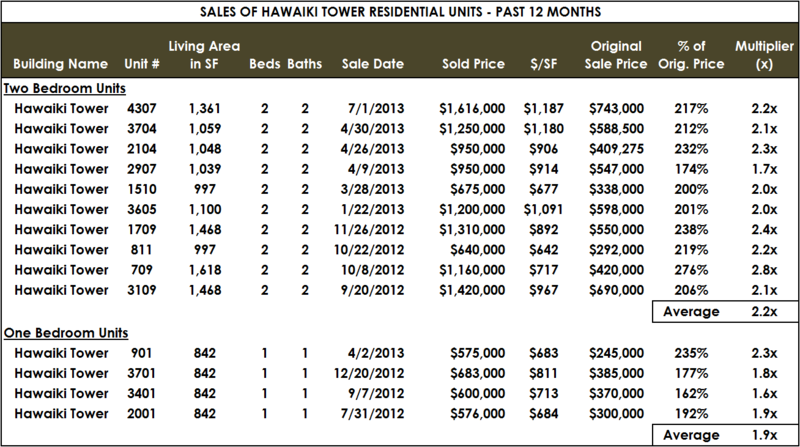 The Honolulu Board of REALTORS® defines the Kapahulu – Diamond Head Local Market Area as including sections (1) 3-1 through (1) 3-4. The map below approximates the boundaries of this area. 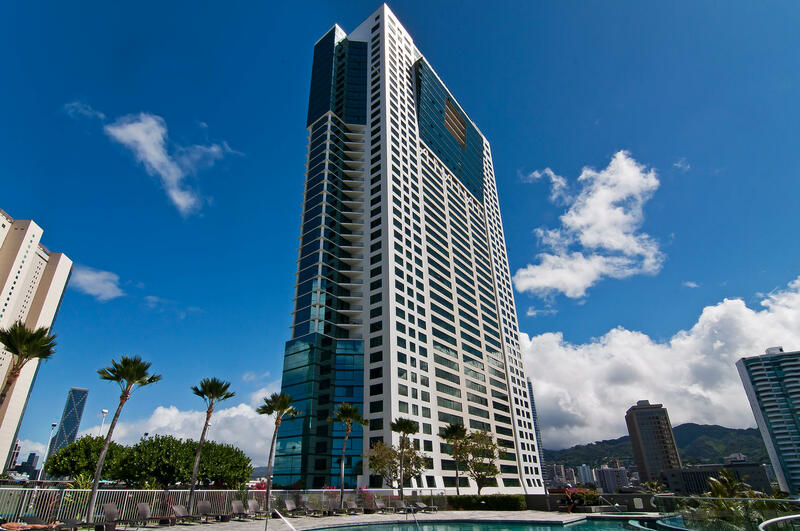 If you’re familiar with Honolulu, you’ll quickly realize that is quite a diverse spread of neighborhoods! Great aloha to be had everywhere, but buyers looking to purchase around Diamond Head might not consider the other areas to be substitutable options. Could my friend be right? Is it possible that his neighborhood (Diamond Head) is a micro-market that survived the Great Recession better than the other areas in his MLS Local Market? It makes logical sense that a desireable location like Diamond Head could have bucked the trend–let’s dig deeper. In order to accomplish this, I researched sales activity in Section (1) 3-1 (my friend’s general neighborhood) from 2004 through 2010, focusing on sales of single family homes that were listed by the selling agent as being in “average” or better condition. My research found 22 “pairings”, single family homes in (1) 3-1 that sold in late 2004, 2005, 2006, or 2007 (the peak of the market), and later resold from September 15, 2008 (Lehman Brothers) through the end of 2010. Of these 22 pairings, 10 were substantially remodeled in the interim, and thus not considered. As you can see, 10 of the 12 paired sales show price declines in the study period, ranging from negative 0.6 percent to negative 25.6 percent. 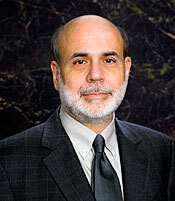 The two positive indicators showed upward figures of 1.4 and 0.6 percent. 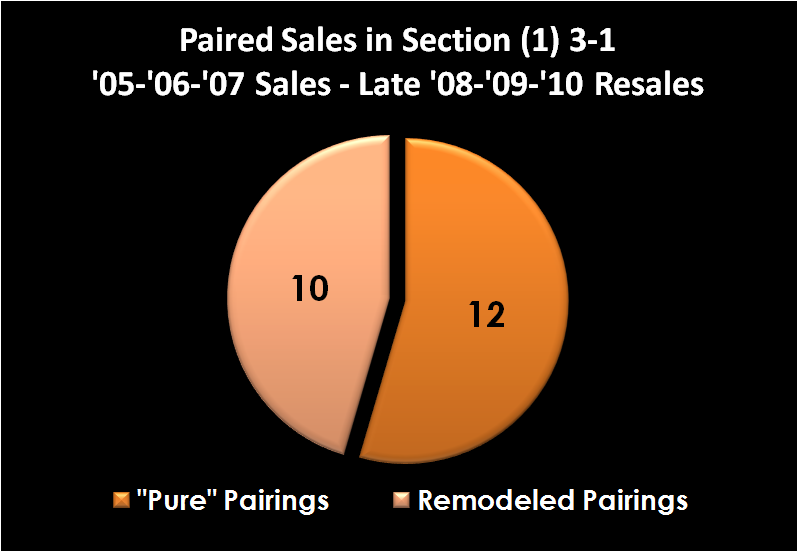 The overall average price change for the 12 “pure” pairings (not remodeled) in Section (1) 3-1 was negative 8.3 percent. Conclusion: Still looks like a price drop after Lehman Brothers, but not a huge one. 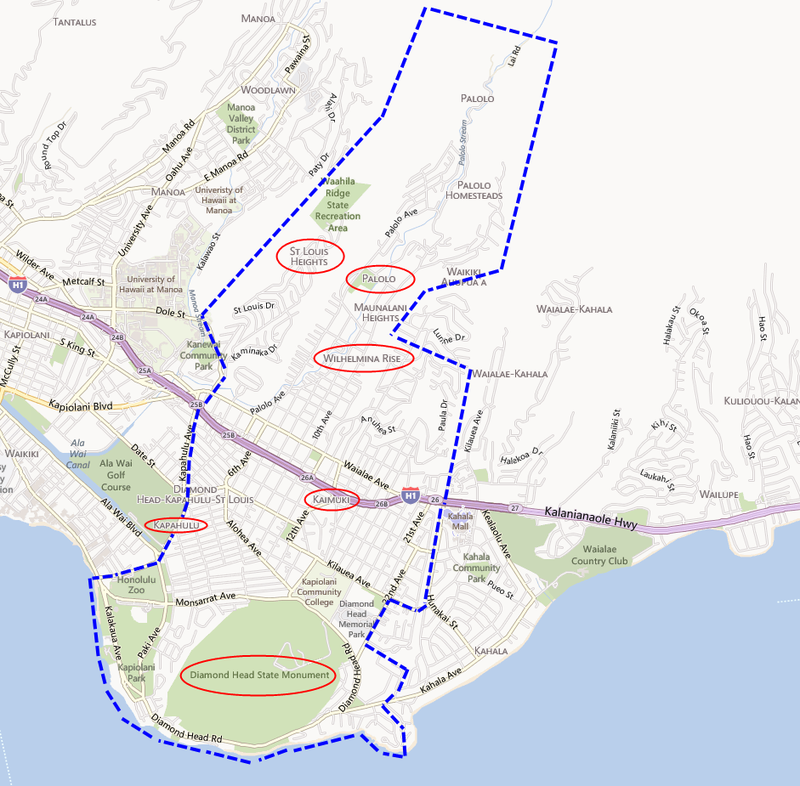 In the end, even though the Kapahulu-Diamond Head MLS statistical zone includes a diverse range of neighborhoods, it appears that the immediate Diamond Head area, like much of the United States, did indeed suffer a setback (negative 8.3 percent according to this analysis) in the early portion of the worldwide financial crisis. If you’re generally familiar with real estate appraisal, you are no doubt aware that the sales comparison approach is the preferred method of valuing land in most situations. That said, there are other techniques that can be developed: Market Extraction, Allocation, Land Residual, Ground Rent Capitalization, and Discounted Cash Flow Analysis. The last three procedures in that list are income capitalization techniques–they are the focus of this article. Subdivisions are often valued via the income approach. Due to the large amount of leasehold land in Hawaii, local appraisers frequently employ this technique to convert ground lease rents into land values. As shown, a property’s annual income can be converted to a land value if a capitalization rate, or “rate of return” as it is commonly called in Hawaii, can be derived from the market. In this example, if an eight percent (8.0%) rate of return was applied to a ground rent of $50,000 per year, the indicated land value would be $625,000. Similar to the Ground Rent Capitalization technique described above, this method converts the allocated portion of a property’s income that is attributable to the land, and again divides it by a land capitalization rate that is market derived. 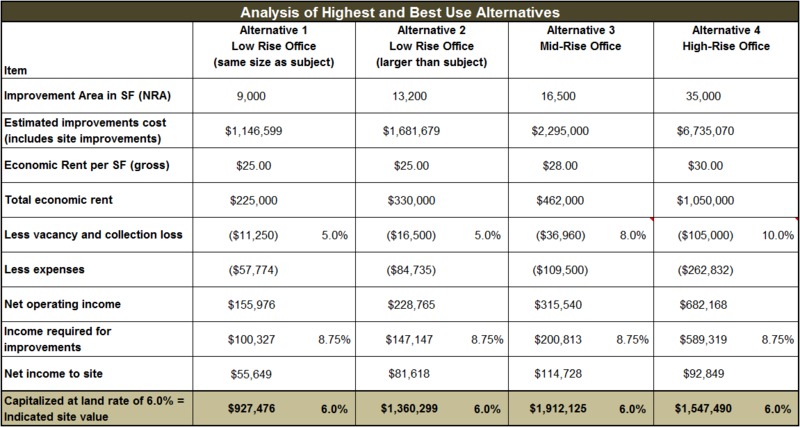 Most often, this method is employed when testing the feasibility of alternative uses in highest and best use analyses. The key difference between this technique and the one above is that income for an improved property is typically the starting point, and it must be segmented (with market support) into the income attributable to land (IL) and income attributable to the building (IB). In this technique, gross sale prices are estimated and costs (such as construction, management, or developer’s profit) are deducted to arrive at net income. 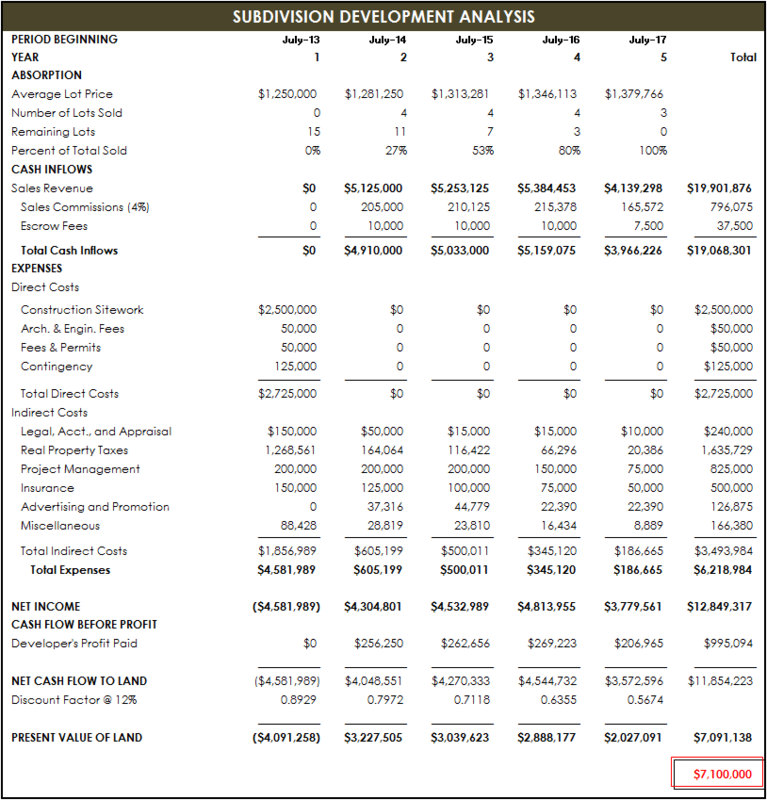 This net income is then discounted to a present value estimate for the underlying land. Hawaii real estate appraisers are often asked to value residential properties that have spectacular ocean views. Not a bad gig, I admit. 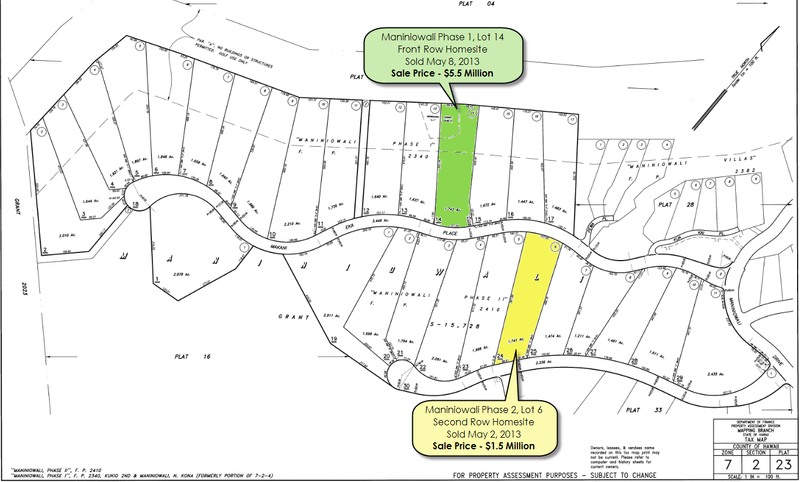 I recently did some appraisal work in Maniniowali, a luxury subdivision in the Kukio membership community on the Big Island of Hawaii. I was valuing a front row lot, and this time, fortunately, there were several recent sales of similar properties to analyze. But this is not always the case. In high-end resort subdivisions, sales occur relatively infrequently–as such, quality comparables are sometimes hard to come by. When appraising oceanfront or front-row properties, it is common to have no recent front-row sales in the subject subdivision. But often times, there are timely sales of second row lots that can give an appraiser a better sense of values in the front row market. The aerial photo and tax map show a front row homesite, Lot 14, and a second row homesite, Lot 6. As shown, the second row lot at Maniniowali sold for approximately 27 cents on the dollar compared to its front row counterpart. Said differently, Lot 14 sold for 3.6 times the price of Lot 6. As an appraiser, I use relationships like this to help me in situations where I am challenged for data. Obviously, this is only one pairing, and I’ll post similar paired sales of front row and second row lots as I come across them, but to the extent this relationship becomes a consistent trend, an appraiser may be able to check the reasonableness of their value conclusions for a front row lot against sale prices of second row lots, and vice-versa. The Sales Comparison Approach evaluates sales of properties that are similar to a subject property. After differences are accounted for, the comparables should represent a reasonable value range for the subject. The Cost Approach calculates the cost to construct new improvements on a site, less any depreciation due to age or other factors. 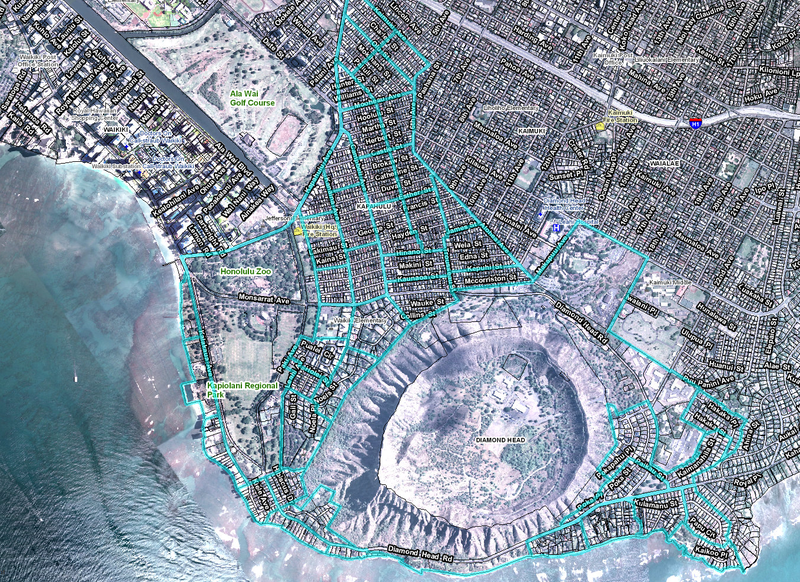 This depreciated cost is then added to the value of the underlying land. The Income Capitalization Approach measures the present worth of (a) future income generated by a property and (b) its eventual resale value. In appraisals of real estate, appraisers are most frequently asked to develop an independent and unbiased opinion of market value for a subject property. Market value is determined by an appraiser who analyzes three types of market data: comparable sales, cost to replace (or reproduce), and income. The process of analyzing data from these sources is commonly referred to as “The Three Approaches To Value”. The following discussion explains each approach. Sales Comparison is the approach to value that the public is probably most familiar with. In this approach, real estate appraisers research and analyze sales of similar properties (“comparables” or “comps”) in order to compare them to a subject property. Sales comparison is usually the most insightful valuation method when numerous timely sales of similar properties are available to study. To the greatest extent possible, appraisers strive to find comparables that buyers would consider to be acceptable substitutes for the subject property. When I select comps, I always ask myself the question: “If the subject property was not on the market, what would the most probable buyer purchase instead?” The goal is to find the most timely sales of properties that an appraiser feels would compete with the subject property in the open market. After comparables are selected, an appraiser develops his or her opinion of value by considering factors that buyers and sellers consider to be important. In the case of a single family home, bedrooms, bathrooms, land area, ocean views, and age/quality of construction are among the factors that would typically be considered. In most cases, mathematical adjustments are made to each comparable sale in order to allow for fair comparisons. If a comparable has a superior trait, such as an extra bedroom, it is adjusted downward to match the subject. If a comparable has an inferior trait, like a one car garage (instead of two at the subject), it may be adjusted upward to equate it to the subject property. After all adjustments, the comparables should indicate the relevant range of values for the subject property. The appraiser’s job is then to evaluate the strengths and weaknesses of the comparables and adjustments, and come to a value conclusion via the sales comparison approach. Generally speaking, the cost approach is based on the idea that a rational real estate buyer would not usually pay meaningfully more for a property than it would cost to build new. The cost approach is most useful in valuing new improvements. In addition, it is often the best (and sometimes the only) method for valuing properties that are rarely sold and/or generate little or no income (such as schools, churches, parks,or military properties). Estimating the cost to reproduce (or replace) the existing improvements . After land value is added to the depreciated value of improvements, the total represents the value of the property via the cost approach. A side note for a future discussion: It is common for appraisers to express the idea that the value indicated by the cost approach “sets the upper limit of value”. Those interested in an in depth refutation of this concept are encouraged to obtain a copy of Nelson Bowes’ new book In Defense of the Cost Approach, published by the Appraisal Institute. The income approach is often summarized as “the present value of future benefits“. Properties that generate positive cash flow can be appraised using a “present value” or “time value of money” concept. The income approach estimates the present value of (a) future income generated by a property and (b) its eventual resale value. The term “capitalization” refers to the mechanism by which future income can be converted into a present value. There are two types of capitalization: Direct and Yield. Direct Capitalization considers one year of income and converts it to a property value. The direct capitalization technique is often referred to as “Direct Cap” or using a “Cap Rate“. The three sales generate annual income of $50,000, $25,000 and $100,000 and sold for $500,000, $250,000, and $1,000,000, respectively. 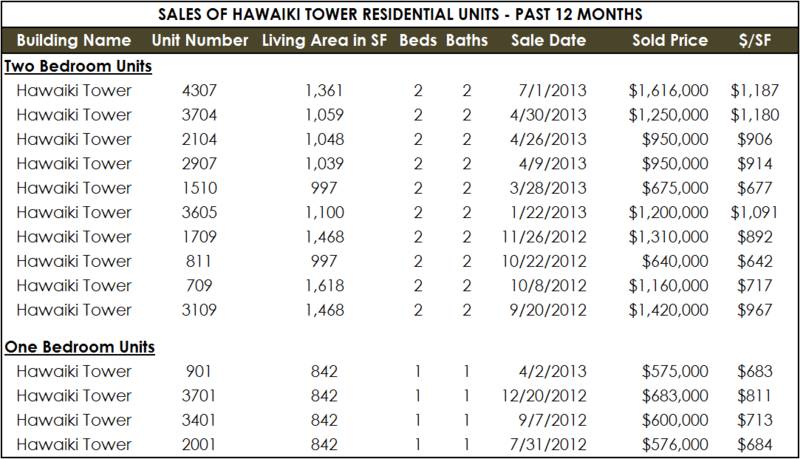 In other words, each of the properties sold for 10 times their annual income. Using this market data, it would be reasonable to conclude that the market is paying 10 times annual income for properties of this type. Given this math, a property with annual income of say $75,000 would be valued at $750,000. 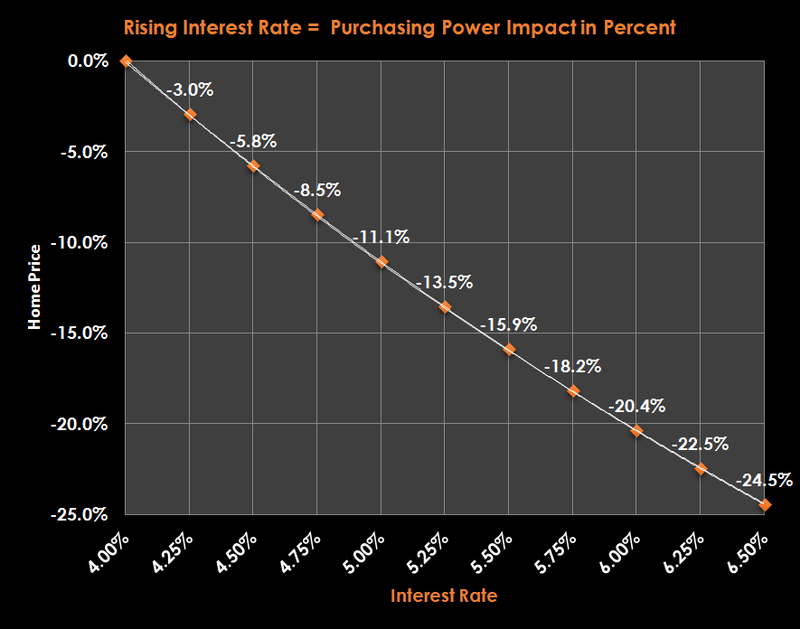 A “Cap Rate” is the inverse of an income multiplier. 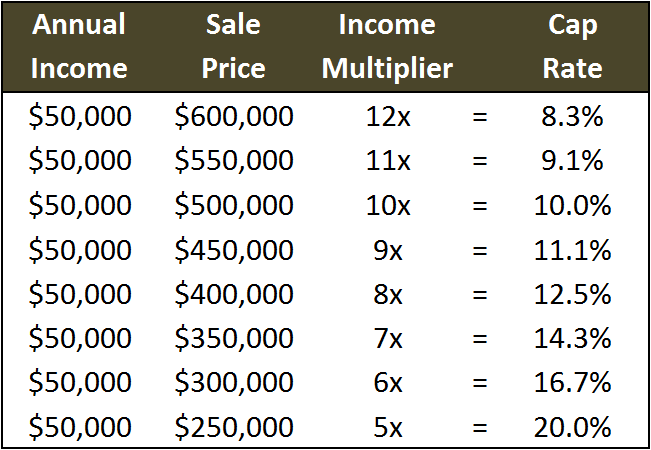 If an income multiplier is 10x, which is the same thing as 10/1 (10 divided by 1), then the cap rate is 10% (1 divided by 10). 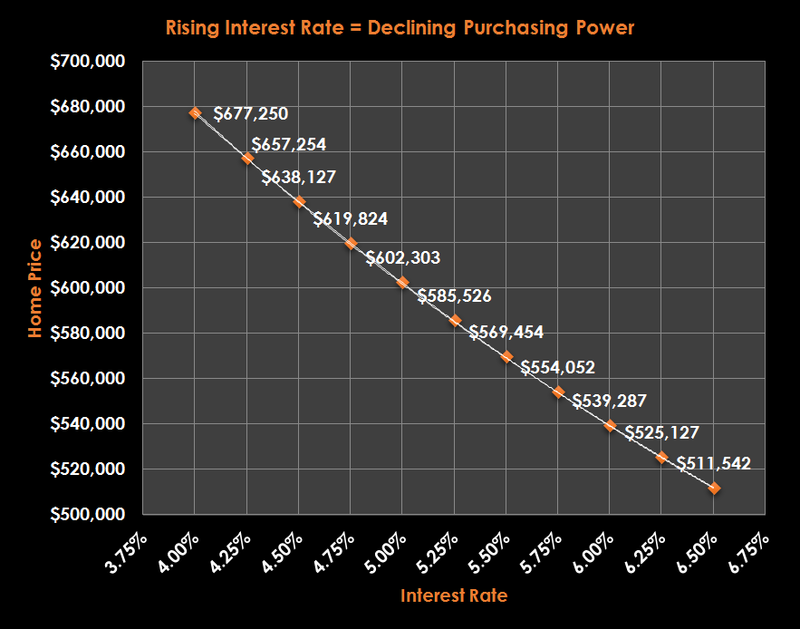 Yield Capitalization differs from Direct Capitalization in one fundamental way: It considers multiple years of stabilized income and the eventual resale of the property. The multiple years of income are converted to a present value using a “discount rate”. The application of this process is sometimes called a “Discounted Cash Flow” or “DCF“. Yield Capitalization considers multiple variables and can become very complex. It is most appropriate for properties that are forecast to have uneven future cash flows (perhaps a large tenant is moving out in 3 years). I’ll write more about this intricate valuation tool in a future article.